It’s no secret that feeding your dog a high quality, well balanced diet to support his nutritional needs is an absolute must. After all, just like humans, canines need to eat a diet that is rich in the perfect blend of vitamins, minerals, and nutrients to maintain a healthy lifestyle. However, when it comes to selecting a high quality dog food, for many pet parents, it’s a task that is a lot easier said than done. There are so many different dog food brands on the market, and unfortunately, not all of them are created equal. While yes, there are several premium quality, well-known brands, like Blue Buffalo dog food, Diamond Naturals dog food, Taste of the Wild dog food, and Rachel Ray Nutrish dog food, unfortunately, many brands are made with poor quality ingredients and are packed with fillers and synthetic flavors, colors, and preservatives that can actually be harmful to your pet’s health. 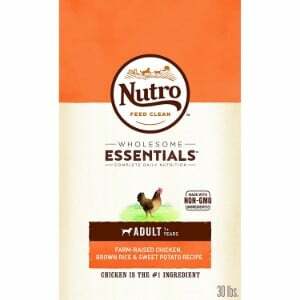 If you’re looking for a premium quality food but you aren’t interested in one of the aforementioned brands, or you’ve tried them before and they just didn’t work for your four-legged family member, for whatever reason, you might want to consider Nutro dog food. What is Nutro dog food? What types of formulas do they make? Why should you consider feeding your pet this brand of dog chow? In this Nutro dog food review, we’ll answer these questions, but first, we’d like to share with you our top five choices for the best Nutro dog food. Now that you have seen our choices for the best formulas that Nutro has to offer, let’s examine each one a little more closely. Below, we offer a more detailed overview of each of these recipes, including the ingredients that they contain, what type of canines they are best suited for, what we like about each one, and what pet parents who have used these recipes have had to say. After you read through the reviews and decide on a formula that you think will best meet the needs of your furry pal, click on the buttons to find the best prices currently available on Chewy and Amazon. 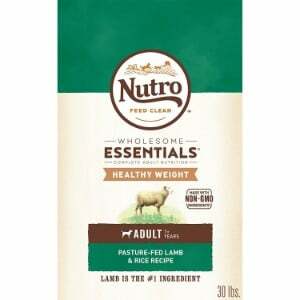 If you are looking for a food for small dogs, like a Bichon Frise or a Soft Coated Wheaten Terrier, or you are on the market for a food for large dogs, if you have an adult pooch of any breed or size, Nutro Whole Essentials Adult Dry Dog Food will offer him the balanced nutrition that your furry pal needs to thrive. Made with premium quality ingredients that have been hand-selected to support the health of adult canines, this food is an excellent option. The first ingredient in ingredient featured in this formula is protein that has been sourced from farm-raised chicken. Protein is a vital nutrient for dogs of all ages, as it offers the amino acids that are necessary for maintaining lean muscle mass and healthy joints. In addition to being a great source of protein, farm-raised chicken offers a flavor that canines love. This recipe also contains brewers rice, split peas, whole brown rice, barley, sweet potatoes, and beet pulp, so it can most certainly be considered a grain free dog food. So, if your pooch has a sensitivity to gluten-based ingredients and needs a dog food for sensitive stomachs, or you just don’t want him to eat corn, wheat, soy, or other gluten ingredients, than this recipe is a great choice. A variety of wholesome vegetables and fruits, like blueberries, carrots, and apples, can also be found in this high quality dog chow. The addition of antioxidants will help to support your pet’s immune system, and omega 3 and omega 6 fatty acids will keep his skin and coat healthy. Lastly, all ingredients are non-GMO, so you can ensure that your pet will be receiving the safest food possible. Final Verdict: Nutro Wholesome Essentials Adult Dry Dog Food delivers wholesome goodness that you can count on to nourish your adult pooch; no matter what breed or size. Made with premium ingredients and free of GMOs, this recipe offers safe, balanced, and delicious nutrition. If your adult furry friend could stand to lose a few pounds, then you should consider feeding him a premium quality dog food for weight loss. Just like people, excessive weight can cause a number of health problems for canines, including cardiovascular issues, joint disease and reduced mobility, and diabetes. That’s why it’s important to feed your pooch a food that is specially formulated to help him maintain a healthy weight. Nutro Lite and Weight Management Adult Dry Dog Food is made to support weight loss and offer the nourishment that adult canines require. This dry dog food features pasture-fed lamb as the first ingredient. Lamb is an excellent source of protein, as it is easy to digest and is packed with the essential amino acids that dogs need to support lean muscle mass and weight loss. Other ingredients include whole brown rice, chickpeas, whole grain oatmeal, and beet pulp, all of which are easy to digest carbohydrates that will provide your canine companion with the fuel that he needs for an active lifestyle. The sources of protein and fiber have been selected to help support weight loss and keep your pooch at a weight that is healthy for his size. The infusion of essential vitamins, minerals, and nutrients, like vitamin E and antioxidants, will also help to keep his overall health in-check. And, like all Nutro dog food formulas, the ingredients featured in this recipe are Non-GMO. Final Verdict: Nutro Lite and Weight Management Adult Dry Dog Food is specifically formulated to help adult dogs lose and maintain a healthy weight. 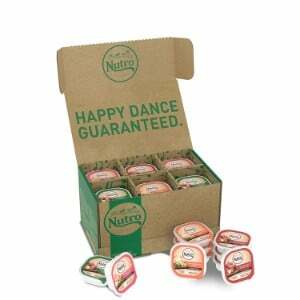 The ingredients are non-GMO and have been hand-selected for the valuable nutritional content that they offer. The nutritional needs of puppies are much different than adolescents, adults, and seniors. Their delicate systems are still developing and they still require some of the essential nutrients that are their mothers’ milk contains. That’s why a lot of pet parents decide to feed their young a puppy milk replacer. But if your pooch has started to develop strong, healthy teeth and has been cleared to start eating solid food, feeding him a chow that is specifically formulated for puppies is the way to go. Make sure that you are choosing a premium quality puppy food that contains the nutrients that growing canines need, like Nutro Wholesome Essentials Puppy Dry Dog Food. This formula is made for large breed puppies, like Malamutes, Siberian Huskies, and Great Danes. The first ingredient is farm-raise chicken, which offers the perfect amount of amino acids to support his developing muscles and maintain the health of his joints. It’s also infused with calcium, which is essential for building strong, healthy bones, and DHA, which promotes healthy brain development. Vitamin E and antioxidants will keep strengthen the immune system of your puppy, and keep his skin and coat healthy, too. A variety of fruits and vegetables, like blueberries, apples, and sweet potatoes, add even more nourishment and create a flavor that your young pooch will love. And, the smaller kibble is easy for little mouths to handle. According to the majority of the Nutro dog food reviews that we read, customers are very happy with this formula, and so are their pets. Final Verdict: With Nutro Wholesome Essentials Puppy Dry Dog Food, you can rest assured that your growing pooch will receive the nutrition that he needs to thrive. Made with non-GMO ingredients and featuring a wealth of essential vitamins, minerals, and nutrients that are vital for puppies, this formula will definitely nourish your young pooch. As your pup ages, his nutritional needs change. That’s why it’s important to offer him a specially formulated senior dog food that offers balanced nutrition to support his overall health and well being. With Nutro Ultra Senior Dry Dog Food, you will have peace of mind knowing that your mature furry pal will received a well-rounded diet that will keep him healthy and satisfied. Protein is vital for dogs of all ages, but particularly senior dogs, that are more prone to orthopedic issues, like arthritis and hip dysplasia. This formula offers protein from three different sources; chicken, lamb, and salmon. It also contains natural sources of glucosamine and chondroitin. These ingredients will help to protect your mature pal’s joints, as they help to promote and maintain lean muscle mass, which is essential for joint health. Whole brown rice, brewers rice, and whole grain oatmeal are natural sources of carbohydrates that are easy to digest, so this formula can be considered a dog food for sensitive stomachs. Other ingredients include peas, flaxseed, chia seeds, coconut, tomato, kale, pumpkin, spinach, blueberries, apples, and carrots; all of which offer vital vitamins and minerals that will help to sustain the health of your older dog. All ingredients are non-GMO, so you can ensure that they are safe for your pooch to eat. Lastly, the infusion of essential vitamins and minerals will further help to keep your canine companion in optimal health. 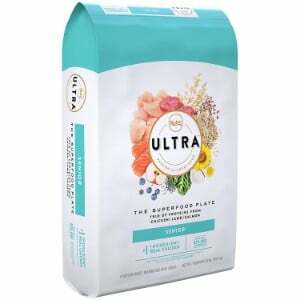 Final Verdict: When you feed your senior four-legged family member Nutro Ultra Senior Dry Dog Food, you can have confidence knowing that he will be receiving the vital nutrition that he needs to sustain a healthy life. Made with premium, non-GMO ingredients, and offering the perfect blend of vitamins and minerals, this product will certainly maintain the health of your pup. For adult dogs that are picky eaters or who have dental health issues and won’t or can’t eat dry kibble, a premium wet dog food is an excellent option. Since it’s softer than dry food, it’s easier for dogs that have mouth pain or missing teeth to eat. Also, because the taste and texture is more similar to the food that your furry pal’s ancestors ate, he likely find that it’s a lot more pleasing to his taste buds. Nutro Adult Cuts in Gravy Wet Dog Food Trays Variety Pack offers balanced nutrition that adult dogs need, and the flavor that they crave. This variety pack contains four different formulas: tender chicken; roasted turkey and vegetables; simmered beef and potatoes, and savory lamb and vegetable stew. All formulas feature real meat as the first ingredient (chicken, turkey, beef, and lamb). The ingredients in all recipes are non-GMO and sourced from highly reputable farmers and suppliers to ensure the best possible quality. There are no artificial flavors or preservatives, and no poultry byproduct meal. You’ll know that your pooch is receiving the best possible nutrition and flavors that will add excitement to every mealtime. Final Verdict: Nutro Adult Cuts in Gravy Wet Dog Food Trays Variety Pack contains four different premium quality wet food formulas. Made with non-GMO, natural, and wholesome ingredients, you can rest assured that your pet will receive the balanced nutrition that he needs and the flavors and texture that he loves. When it comes to feeding your pet, it’s so important to ensure you are selecting a high quality food that will not only meet his nutritional needs, but that will also make his taste buds happy. Unfortunately, not all types of dog food are on the same level. Sadly, many contain subpar ingredients that offer little nutritional value and can actually be harmful to your pet. That’s why it’s so important to do your due diligence and thoroughly research the food you are considering to ensure that it will actually benefit your four-legged family member. One of the highest quality brands of dog food on the market is Nutro dog food. If you’ve never heard of this brand before and you are wondering why we recommend it, read on to find out more about this very dog food manufacturer and the products that they offer. Nutro is a brand of dog food that has been around since the 1920s. Their headquarters are based in Tennessee, and all of their products are sourced and made in the United States. They provide a wide range of formulas that contain premium quality ingredients that have been hand-selected by food scientists, animal nutritionists, and veterinarians to deliver the best possible nutrition for pets of all ages, sizes, and breeds. Most pet owners who feed their furry friends’ Nutro dog food are loyal customers. They are very pleased with the quality of the food, the nutrition that it offers, and they say that their dogs’ seem to very much enjoy the taste. There are several reasons why pet owners trust Nutro dog food, and why you should consider feeding it to your pet, too. This pet food manufacturer is committed to using only non-GMO ingredients in all of their formulas. That means that their food is not altered by pesticides or other harmful ingredients that have been found to have adverse effects on canines. To ensure this, the company works with highly reputable farmers and food suppliers that are also committed to making the healthiest, non-altered ingredients possible. 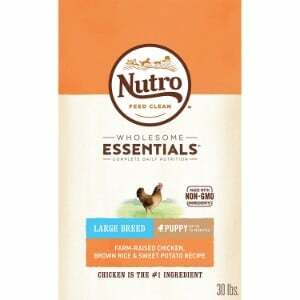 In addition, Nutro also makes sure that all of their recipes are free of artificial preservatives, colors, and flavors, which many pet food manufacturers use in their formulas. Furthermore, there are absolutely no fillers or animal byproducts in their recipes. And, most of their recipes are free of gluten-based ingredients, like wheat, corn, and soy, so if your canine companion is allergic or sensitive to gluten, or has a sensitive stomach, than their food should suit his needs. As mentioned, Nutro offers a wide variety of formulas to meet the nutritional needs of dogs of all sizes, ages, and breeds. Whether you have a puppy, an adult, or a senior dog, you will be able to find a recipe from Nutro that will offer him well-balanced nutrition from wholesome ingredients. While all of the dog food that Nutro makes is made with the best, highest quality ingredients, we wanted to select five different options that would meet the needs of most pet parents. In other words, our goal was to offer you choices for puppies, adult dogs, and senior dogs of all breeds and sizes. With that said, we met with a team of animal nutritionists and veterinarians, and together, we determined what type of nutrition puppy, adult, and senior dogs need. We then analyzed the ingredients in the different Nutro formulas and, based on our assessment and the nutritional requirements of canines, we selected what we think are the top five options from this manufacturer. When it comes to feeding your four-legged family member, it’s absolutely essential that you choose a premium quality dog food that is made with the best possible ingredients to support a dog’s nutritional needs. Of all the different pet food options on the market, Nutro is, without a doubt, one of the best brands you can find. Whether you choose one of the five formulas featured in our review, or any other formula, you’ll have peace of mind knowing that the furriest member of your family is eating a well-balanced diet that will nourish him, keep him healthy, and keep him satisfied.